Imagine waking up in a mountain town at the base of the Himalayas. You hear temple bells ringing in the distance and sip on a steaming cup of chai tea as you walk to your yoga class with a local instructor. 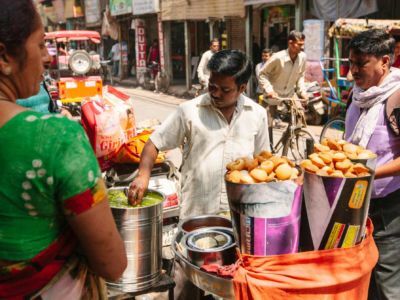 Later on, you shop for brightly colored saris in the nearby markets before connecting with your travel companions for a delicious Indian dinner, including hot naan fresh from the oven. The flavors are so rich your mouth waters to thinking about them. You find yourself looking forward to a coaching workshop in the evening — a time to connect more deeply with your fellow travelers and talk about everything you’re learning about yourself in this vibrant country. Our transformational trip to India runs from January 19 – 30, 2019 and will be an explosion of color, community, creativity and exploration. Namaste! Welcome to India. We start off with a rest day so you can recover from your flight. Enjoy getting to know your fellow travelers and then meet up for a brief orientation before our first group dinner — an authentic North Indian meal! Join your local trip leader on an excursion through Old Delhi. Ride the city’s metro system, and then hop in a traditional cycle rickshaw to the once water-filled square of Chandni Chowk. Discover the Jama Masjid, Delhi’s oldest mosque, before learning about the history of the Sikh religion at the Sheeshganj Gurudwara. Later this afternoon, you will have your first group coaching session. Your evening is free. Travel to Agra by train (approximately 3 hours). This is where you’ll find the iconic Taj Mahal. Best known as a monument to love and loss, the 17th century Taj is a beautiful example of Mughal architecture, surrounded by trimmed English gardens. Spend some time exploring this marvelous site and then visit the Agra Fort, one of the finest forts in the country. This dark red sandstone stronghold is part fortress, part palace and part prison. Search through the throne rooms and tiny but incredibly decorated mosques. Today we drive to Karauli (approximately 3.5 hours). This delightful town was founded in 1348 and is packed with rural ambience and traditional temples. Take a Guided Walk around the Old Quarter, interacting with friendly locals and learning about rural Indian life off the tourist trail. Be sure to visit the eclectic market stalls along the way and sample some seasonal local sweets made from Indian ingredients, including petha (pumpkin), jiggery (organic sugar), peanut brittle and gazak (sesame seeds). Head back to the hotel in the afternoon for a nap before our evening coaching session and group dinner. Travel by road into Rajasthan and on to its capital, Jaipur (approximately 5 hours). A friendly, busy town crammed with palaces and bazaars full of jewelry, textiles and folk-based arts, Jaipur is a favorite for many travelers. Visit the the local palaces and other sites during the day. In the evening, you’ll have a moonlight yoga class. Rise early and visit the Amber Fort. Set on a hilltop overlooking Maota Lake, the fort is an authentic example of Rajput architecture and the Sheesh Mahal (Hall of Mirrors) is one of its more spectacular buildings. Unwind and talk about your experience so far during a coaching session in the afternoon. Afterward, join in on local fun at a Bollywood Movie at the famous Raj Mandir Cinema. After a morning Bollywood Dance Class with a local instructor, you can enjoy a free day in Jaipur. This morning we fly to Rishikesh, known as the birthplace of yoga and the yoga capital of the world! Check in to your hotel before going on an Orientation Walk. In the evening, enjoy a healthy and leisurely dinner and stroll along the holy Ganges River as temple bells ring and the nightly fire ritual of Ganga Aarti begins. Being sacred, Rishikesh is a dry town and alcohol is prohibited. Start the day with an early morning Yoga session. Afterward, the rest of the morning is yours to roam around Rishikesh. Perhaps tuck into a Masala Dosa for breakfast before walking it off on one of the trails along the Ganges. In the afternoon, proceed for a walk through the jungle to nearby waterfalls and caves. We will find a beautiful location along this route for another coaching session. Your evening is free. Take a yoga class and enjoy a coaching workshop before heading out on the town to enjoy some coffee, health food or classic South or North Indian cuisine. Make sure to hit the Devraj Coffee Corner and neighboring bookshop for a hot beverage and some nice views. Rise early and take the train back to Delhi (approximately 4.5 hours). You will be transferred to your hotel on arrival. Later, enjoy a coaching workshop before a cooking class with dinner. Your trip comes to an end in New Delhi this morning. Hop on the group transfer back to the airport and say your goodbyes.